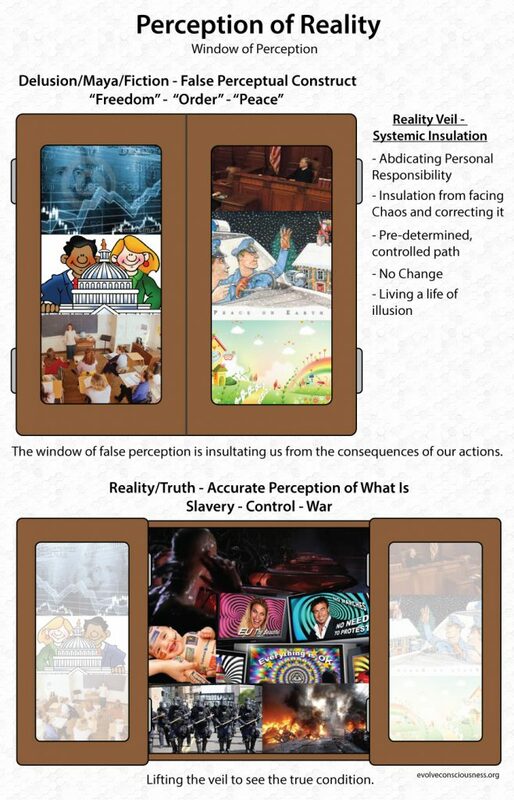 The conditioned perceptual window that most people view their surroundings from creates a fictional worldview that has them “seeing” semblances or proxies for freedom, order and peace that they take as the real thing. The perceptual veil of illusion has us abdicating our personal responsibility. The system is constructed to insulate us from facing the consequences of our actions and chaos that we produce as a collective whole, letting us enjoy the illusory pleasures and distractions. We are led along predetermined and ultimately controlled paths and ways of living. Our adherence to the many illusory constructs puts us in a position of inability to affect change since we can’t even see the nature of the problem correctly, or that there is even a problem to begin with! Most people are living a life of illusion. Once we face reality and accurately see the true condition we have let manifest around us, we recognize and acknowledge the problem. We can then assess, analyze and diagnose the current condition to arrive at the nature and root causal factors that created the current reality. Ignorance of the problem assures that no change towards proper correction is possible.